The next significant part of Atari's history is their entrance in the home market. 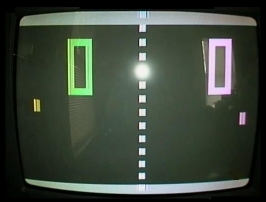 In 1973, Harold Lee suggested that a home version of PONG be made. Atari started the design of the Darlene project in 1974. Harold Lee, Alan Alcorn and Bob Brown designed the prototype. 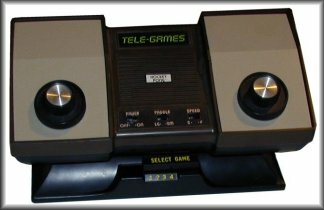 Because Magnavox Odyssey was already becoming obsolete and somehow left behind by customers, sellers were not attracted by Atari's new PONG game until Sears goes ahead and sells the system under their Tele-Games label for Christmas 1975. Following this huge success, Atari released its own version of PONG in 1976. The system had an important feature that most others didn't have in 1975: the use of a single chip that provided games with digital on-screen scoring and attractive sound. As a matter of fact, other systems were still using analog or digital circuits using discrete components. 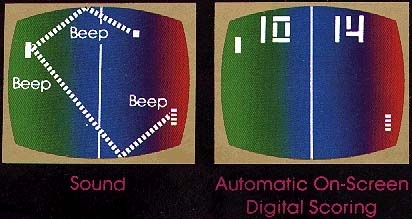 Digital on-screen scoring would have required more components in the circuits, hence an increase of the retail price. Because Atari designed a special PONG chip, the system could sell at normal price with advanced features. 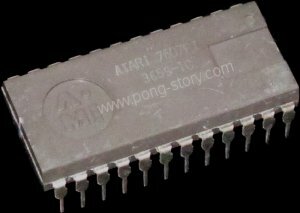 More information about the development of the Atari PONG chip and console can be found on Curt Vendel's site. Atari PONG circuit board with a chip made by AMI. 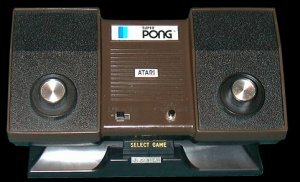 PONG (model C-100): Atari's first system (1976). Atari Super PONG, model C-140 (1976). It plays 16 games for 2 players. 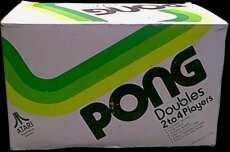 Ultra PONG Doubles (model C-402D). 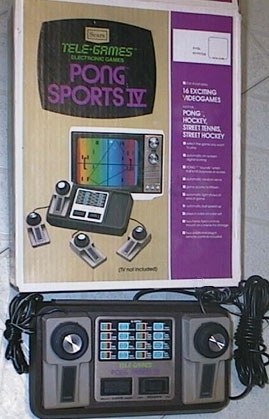 Also released by Sears as PONG IV. Super PONG in PRO and AM modes. 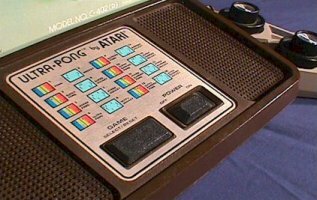 In 1975, Atari was rejected by toys and electronics manufacturers and most other PONG systems didn't sell much. One of Atari's directors decided to contact Tom Quinn, who worked at Sears/Roebuck. After several meetings with Bushnell, Sears ordered 150,000 PONG systems for Christmas. 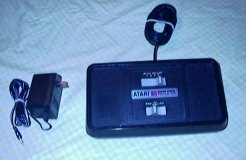 Assembled by Atari, the system sold under the Sears Tele-Games label. 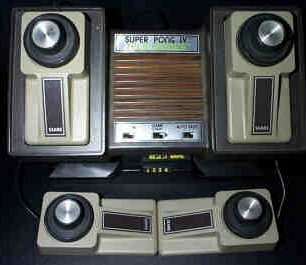 Some people still remember Christmas 1975 when they were going to the shops early in the morning and wait several hours to sign a list allowing them to receive a PONG system. Pong will be a huge success, and will be the cause of multiple imitations and several law suits. However, its popularity did not fall until more advanced systems came on the market. 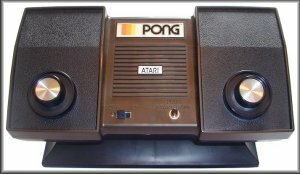 Because PONG already existed in several variants in the arcades, Atari released a line of more advanced systems, playing more games based on the Ball and Paddle principle. Super PONG (model C-140) followed PONG in 1976. It played four games for two players. 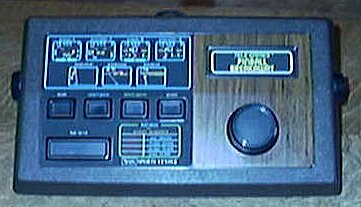 This game was also sold by Sears as Super PONG, but this version used detachable controllers, which were more convenient than fixed knobs. This novel feature was rarely used at that time. 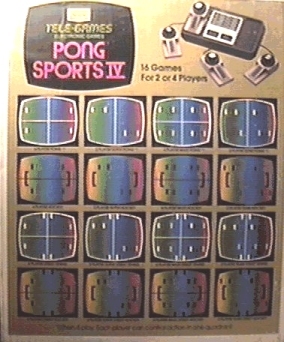 PONG also existed for four players in the arcades: PONG Doubles. 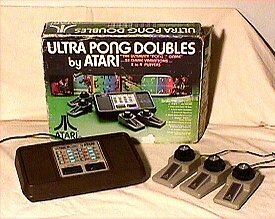 Thus, Atari designed PONG Doubles for homes (C-160). 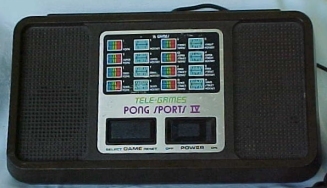 This version did not reach the market for unknown reasons, but a Sears version was released as PONG IV. 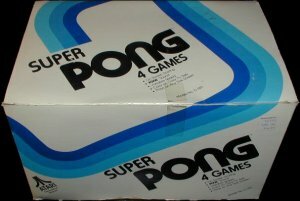 Since Super PONG was a 2-player game, the same version for four players was released: Super PONG IV. Here again, only Sears released a 4-player version. 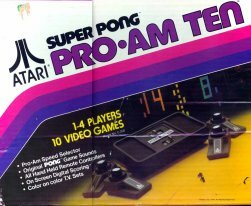 As these systems were very successfull, Atari designed more advanced versions, most of which were also sold by Sears: Super PONG Ten (C-180, 10 games for two players), Super PONG PRO-AM (C-200, playing Super PONG games in PRO or AM modes), Super PONG PRO-AM TEN (C-202, same as before but playing 10 games), Ultra PONG (C-402S, 16 games for 2 players), Ultra PONG Doubles (C-402D, same as before for 4 players). These two last models were sold by Sears as PONG Sports II and PONG Sports IV. 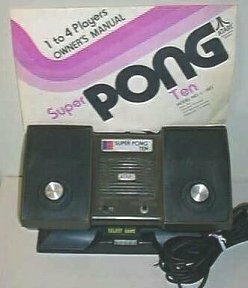 Sears also released a strange system called Super PONG IV (model 99789, not to be confused with the older Super PONG IV, model 99737). This one was the equivalent to Atari's Super PONG PRO-AM TEN (C-202). 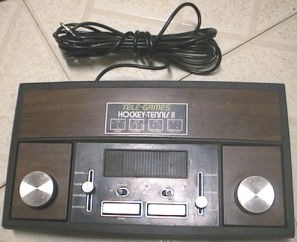 Because Sears was such a large dealer, other PONG clones were sold by the company, of which the HOCKEY-TENNIS series, originally designed by APF for their TV-FUN systems. HOCKEY-TENNIS II played the same games than HOCKEY-TENNIS III, but the former had a black and white picture whereas the latter was in color. Because these systems were not designed by Atari, they used non-Atari video game chips, which we will detail later. Sears PONG: the first system sold by Sears. 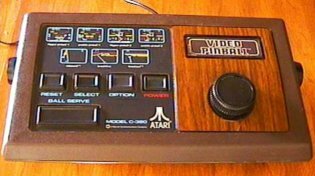 but with detachable controllers, and a woodgrain style ! Hockey-Tennis II, a different system from the others. It plays four games and uses a GI chip. Hockey-Tennis III is same but displays a color picture. 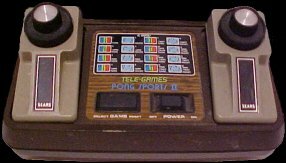 PONG Sports II: one of the last models. It played 16 games for 2 players. PONG Sports IV: same, for 4 players. The story of Atari and Sears systems was not finished yet. In 1977, a new type of ball and paddle system was launched: Video Pinball. 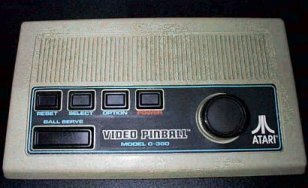 This game also existed in the arcade under the same name, hence the home versions sold by Atari (Video Pinball, model C-380) and Sears (Pinball Breakaway, model 99713). These two systems were designed around a more advanced chip than the PONG-in-a-chip devices, possibly a microcontroller (believed, since the system also contains a small RAM chip which role is unknown, but believed to be for the display and/or score storage). The microcontroller is referred as C011500-1, although the system uses another Atari chip referenced C011512-05. The games played are based around the pinball and breakout principles. Depending on the game selected, the ball bounces on two bumpers (pinball games), or on a pad that moves horizontally (pinpaddle games), or just like in breakout. Obviously, each game had its own principles. In reality, the system played three different games. The first one had four variants and was a pinball game. Some graphics and the type of bounce changed. The second game was a basketball game. The ball bounced on a pad moved horizontally, and the goal was to let the ball go in a multicolor basket. The third type of game had two variants and was breakout. The only difference between the two variants of this one was the way the bricks were destroyed: either the ball bounced on the first brick destroyed, or it continued destroying the bricks without bouncing until an edge of the screen (or the paddle) was reached. (first woodgrain model and second white model). Left: Sears Pinball Breakaway (model 99713). Although the pinball systems didn't play true PONG games, Sears also released two system playing PONG variants and car racing games: Speedway and Speedway IV (designed by Atari). The games could be played by one, two or four players, the number of players being set by a switch and the number of extra pads connected to the system. The switch toggled the HUMAN and ROBOT modes. The former was for two or four players (two using the hard-wired controllers, four using the extra two controllers that could be plugged to the unit). The latter was a single-player mode agains the machine. 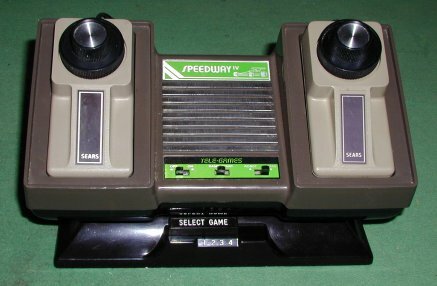 A third system called Speedway was also made by Sears. This was a cheaper version of VIDEO ACTION IV, also known as INDY 500 and sold by Universal Research in 1976. Obviously, one could modify this version of Speedway to play the fourth game. All these systems used a dedicated chip (F4301) made by Universal Research Labs in 1976, and packaged by Omnetics Inc.
the edges of the system. 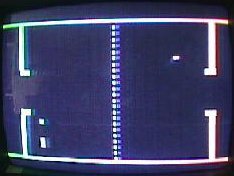 A screen-shot of a Speedway IV PONG variant. In 1975, Atari released another successfull arcade game: Stunt Cycle. The goal was to jump over an increasing number of buses. The screen was divided in three horizontal levels representing the road. The first two levels had small obstables, and the bottom level had the jump and buses. One bus was added after each level completed. Of course, this game had nothing to do with PONG, but Atari released a home version of it in game in 1977: Stunt Cycle (model C-450). Sears sold an equivalent, but with 16 additional PONG games (same as those of the Ultra PONG Doubles and PONG Sports IV systems): Sears Motocross (model 99729). 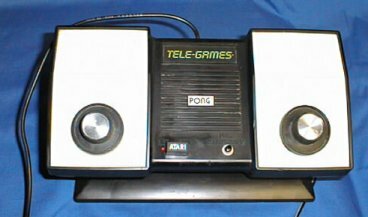 Yet another system that combined PONG and non-PONG games. Amazingly, Atari's version did not contain the PONG chip. This could be for marketting reasons.